Mill-Max offers receptacles (discrete sockets) on carrier tape per EIA-481 to feed automated 'pick 'n place' assembly equipment. Our standard reel size is 13". 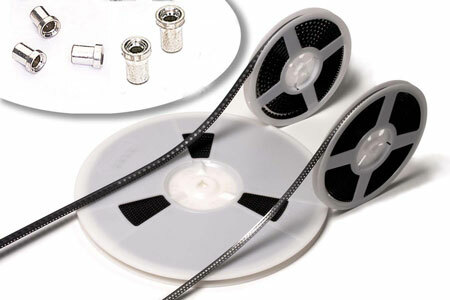 Two types of receptacles are available on carrier tape: surface mount, flat types, which sit on the surface of the PCB where the pin or component lead plugs-in parallel to the PCB; and through-hole types where the lead plugs-in perpendicular to the PCB. Through-hole receptacles are intrusive reflow soldered*. In addition, through-hole receptacles are available loaded with our Organic Fibre Plug® barrier which prevents solder, paste or flux from contaminating the spring contact. After soldering, the OFP® barrier is pushed out of the receptacle when the device is plugged in. *Intrusive reflow (also called "pin-in-paste") is a technique of using conventional through-hole components in a reflow soldering process. The receptacles are placed into plated-through-holes in the circuit board (solder paste has previously been screen printed on pads adjacent to the holes) and the board is reflowed in the same pass as other SMT components. Solder will fill the plated-through-holes and achieve solder joints as reliable as wave soldering. The OFP® barrier prevents solder paste from being picked-up inside the contact during pick 'n place assembly. "Overprinting" paste on the solder mask can be used to adjust the volume of paste required to fill each hole.